The traditionally recognized site of Mount Sinai is Jebel Musa (“Mountain of Moses”) in the southern Sinai Peninsula. This identification was first made in the fourth century A.D. in the pilgrimage journal of a woman named Egeria. Nearby is a broad plain called er-Raha, the only place in southern Sinai that could have acommodated all migrating Israelites. But this area has little water. The Israelites’ movements was slowed by children and livestock (see Exodus 12:37-38). According to Deuteronomy 1:2 Mount Sinai is an eleven-day journey on foot from Kadesh Barnea – probably modern Tell el-Qudeirat in northern Sinai. This would place Mount Sinai in the northern Sinai Peninsula, roughly 96 km from Kadesh Barnea. But Deuteronomy 1:2 reveals that the average traveller could complete the trip this quickly. This suggests a location considerably farther than 96 km away. Camp locations along traditional trade routes were often more than 48 km apart. If anything, Deuteronomy 1:2 excludes locating Mount Sinai at less than 323 km from Kadesh Barnea. Moses requested permission for Israel to make a three-day journey into the desert (Exodus 5:3). Assuming that the Israelites intended to travel to Mount Sinai, the mountain had to be within a three-day trek of Egypt. However, Exodus 5:3 says nothing about an intention of going to Sinai. Midian, where Moses lived after his initial flight from Egypt (Exodus 2:15), was in Northwestern Arabia. Because the Midianites ranged over a large area (Judges 6:1-6), Moses need not have lived in Arabia per se. However, the fact that som Midianites had left their homeland is not pertinent; the text states that Moses lived “in Midian” (almost certainly Northwestern Arabia), not “among Midianites”. Moses first encountered God at Mount Sinai while shepherding Jethro’s flock in “the far side of the desert” (Exodus 3:1; some versions say “west of the desert” or “behind the desert”). 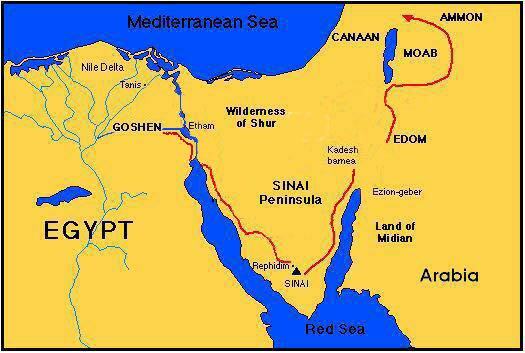 Moses must have guided Jethro’s flock from Midian toward the east, since the Red Sea formed Midian’s western boundary. Midian was located in the low, coastal area of western Arabia called Tihama, an extremely hot region during the summer. Just east is a desert named Shifa, and behind that is the Hisma, with a higher terrain and numerous oases. Shepherds routinely escaped the heat by moving up into the Hisma; this may be what Exodus 3:1 describes. According to Exodus 19:16-17 and Deuteronomy 4:11, Mount Sinai blazed with fire, was enveloped by a huge plume of cloud or smoke and shook violently as in an earthquake. Flashes of lightning and sounds like trumpet blasts also occurred. The description fits a volcanic eruption. The emission of hot gases from fissures can produce trumpet-like sounds, and observers have reported seeing massive electrical displays emanating from volcanic clouds. No volcanoes are known to have erupted during that period in the Sinai Peninsula, but Arabia has many volcanoes. One volcanic mountain in the western Arabian Peninsula, Hala al Bedr (Mount Bedr), is according to this theory a particularly promising candidate for ancient Mount Sinai. It is isolated and could have been described as in Exodus 19:12. Volcanically active during that period, the mountain sits at one end of a large, table-shaped mountain (about ten km in diameter) called Tadra. Tadra, large enough to have accommodated the Israelite camp (Exodus 19:2), sits in a fertile basin called al-Gaw, with numerous wells and relatively lush flora. The Israelites’ eleven-month stay (Numbers 10:11) would have been impossible unless the area had access to water (see also Exodus 19:14). Demetrius, a third-century B.C. Jewish historian, made third connection. The apostle Paul stated that Mount Sinai was in Arabia (Galatians 4:25). As always, caution is necessary. Archaeology is not an exact science, and archaeologists have not fully investigated the possibility of an Arabian location for the Sinai.